Dorothy Ann Marie Larson, age 90, of rural South Haven, died Saturday, January 12, 2019 at Meeker Memorial Hospital. Her funeral service will be held on Friday, January 18th at 1:00 PM, with visitation starting at 12:00 PM at Grace Lutheran Church with Pastor Eileen Mehl officiating. Arrangements are with the Swanson Peterson Funeral Home in Cokato. Dorothy was born April 21, 1928 in Kingston Township, Meeker County. She was the daughter of Oscar and Hulda (Louma) Peterson. She was baptized June 10, 1928 by Pastor P.W. Pelto and confirmed on June 8, 1941 by Pastor John F. Paana at the Kingston Apostolic Lutheran Church. She attended school through the 8th grade. Dorothy was united in marriage on July 31, 1948 to Ernest Elroy Larson at Grace Lutheran Church. Together they had 10 children and shared 70 years of marriage. Dorothy started working at a very young age. She had various jobs from being a grocery store clerk to working in a factory, along with being a full time mother to 10 children and a homemaker. She worked relentlessly from morning to night without a complaint and always with a smile on her face. Visitors were always welcomed with a cup of coffee and a homemade treat. No one ever left her home hungry! She made sure that all of her children attended Sunday School, confirmation, and church. 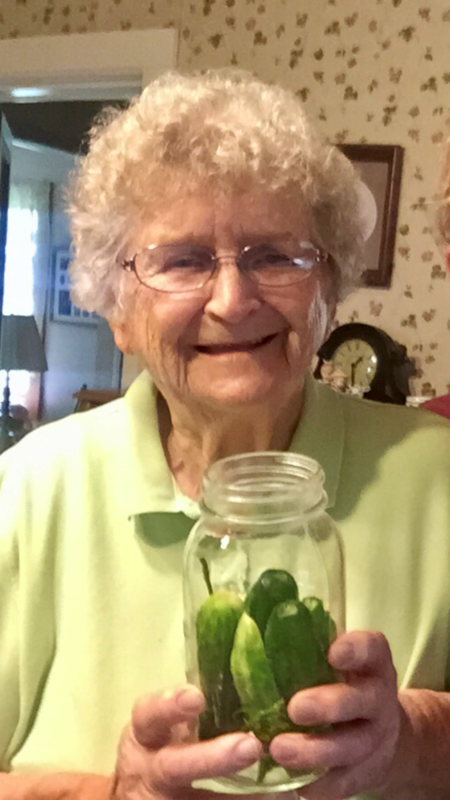 Dorothy attended all of her children and grandchildren’s programs at church and school, confirmations, graduations, recitals, baptisms, showers, and weddings. Dorothy enjoyed traveling to Germany, Louisiana, Florida, and Colorado. She loved spending time with her family. Her hobbies included embroidery work, word search books, canning, gardening and most of all, mowing the yard. Dorothy will be dearly missed by her family and many friends. Dorothy was preceded in death by her parents, son David, son-in-law Tom Mueller, 4 brothers; Alden Peterson, Wilbert Peterson, Arnold Peterson and Roger Peterson, 4 sisters; Lori Carlson, Margaret Henrickson, Margie Mueller, and Estella Merriman. She is survived by her husband Ernest, 9 children; Karen Duarte, Deanna Mueller (Bob Haapala), Loren (Tammy), John (Mary Ann), Gail (Mark) Dunderi, Mike (Robyn), Tom (Barb), Robert (Emily), Mariann Helmin, 27 grandchildren and several great and great-great grandchildren, sister Marlene Ahlm., nieces, nephews and many other relatives and friends.